This beautiful detached villa with large garden is the ideal vacation spot to completely relax. The well maintained garden offers many possibilities: enjoy the sun and breathtaking views from the sunbeds in complete privacy, cozy wining in the shade of the trees in the comfortable garden chairs and eating outside under the porch with a view of the sunset. Almost all summer long it is possible to pick fruit yourself directly from the trees. At night the garden and villa are suggestive lit. The cozy living room is ideal to be together and the kitchen has a large antique dining table with place for the whole family. The four bedrooms and two bathrooms make sure everyone has enough privacy. 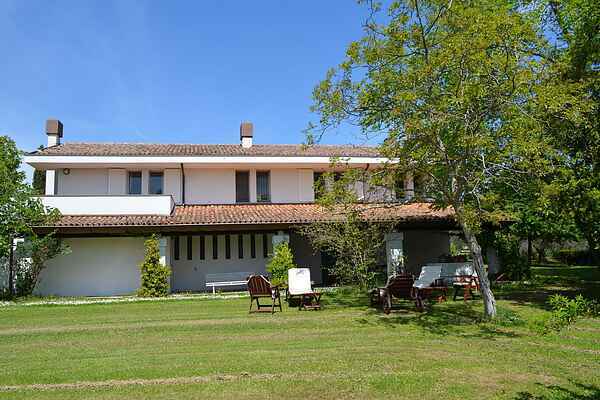 The location of this villa is ideal, Rimini with its beaches, shopping and nightlife can be easily reached by car within 10 minutes. But also lots of picturesque villages and towns are easily accessible such as San Marino, San Leo, Gradara and Urbino. Besides the beach, the coast also offers many attraction parks such as Acquafan, Oltremare, Mirabilandia and Aquario di Cattolica . The internet is fast and reliable thanks to a new antenna. Emilia Romagna is known as "the" region with a big gastronomic culture. Therefore “Your Italian Services” has put together a program with above all gastronomic experiences that you can have in the immediate surroundings. Unique experiences for the whole family! How about a cooking course where you learn how to make tagliatelle and tortellini, or a day picking olives or grapes (you will experience the complete production process of oil or wine making and will have lunch at the farm). You can also be a farmer for one day at an Italian farm or looking for truffles. We also organize tastings of local products directly at the producer. Some experiences are periodical. Please contact us at least one week in advance by e-mail (info@youritalianservices.it) so we can organize everything in the best way for you. Leisure and theme parks: Acquafan – Riccione www.aquafan.it Oltremare – Riccione www.oltremare.org Mirabilandia – Ravenna www.mirabilandia.it Acquario di Cattolica – Cattolica www.acquariodicattolica.it Fiabilandia – Miramare di Rimini www.fiabilandia.net Italia in Miniatura – Rimini www.italiainminiatura.com Nice excursions in the surrounding area: Montefiore Conca Saludecio Mondaino Montegridolfo Santarcangelo di Romagna Verucchio Montebello & Torriana San Leo San Marino Rimini Ravenna Faenza Urbino Gradara For children there is a small pool available, please inform the houseowner if you are interested.